In other words users can only review products that they have actually bought. The Admin can of course add new reviews and moderate/edit existing reviews. 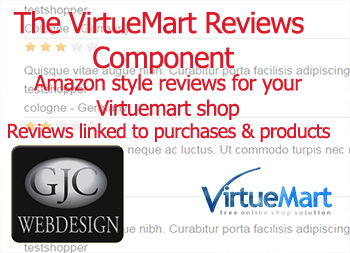 At the moment any VirtueMart registered user can review any product whether they have bought it or not. When an order is confirmed in your Virtuemart shop a plugin stores the details of each product purchased along with the product image and can even be set to copy this image to a save folder so if the product is later deleted the images are still available. Depending on your settings a reminder email can be sent out to the client after a configurable time asking them to review their product. When the client logins to your site in the "My Account" area is an extra tab with all the products he has purchased (note products - not orders) and there they have the ability to place a review for each product or read the reviews they have placed before hand. Of course there is full management for the Administrator to moderate, publish and set up new reviews. 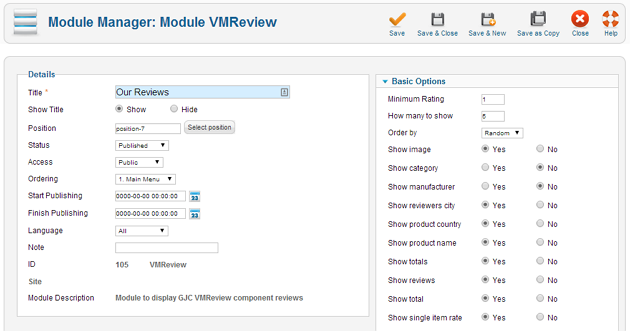 The reviews can be displayed in multiple ways - either as a review page or as modules that can be set to display in various ways. A lot more information is contained in our handbook which you can download here - Virtuemart 3-2 Product Review Package Instruction PDF . There is full management and moderation of all reviews. The user has a full over view of their purchases and reviews. Is there a way for me to test the emails that will be sent to customers after purchase? I want to see how customizable that is. Also, is there a way for me to test the whole plugin before I purchase because it is pretty expensive? it is a full component with 3 plugins and a module - a complete reviews solution.. did you download the pdf etc and try the test site? The emails are fully configurable thru the language ini's e.g. VMCUSTOM_REVIEWS_BODY3=" you purchased item "
VMCUSTOM_REVIEWS_BODY5="If you are satisfied with this product we would be delighted if you would leave a review via our sites member area.\nSimply login and browse to 'Your Account' where you will be able to submit your review.\n\nThank you." If you email me on webmaster@gjcwebdesign.com I can make you an admin for the site so you can trial it. 2. Built in importer to import all orders that belong to registered customers. These purchases are then available for the client t add a review in their Account area and reminder emails can be sent out in batches automatically. 3. html mails with placeholders possible in the email plugin. 4. 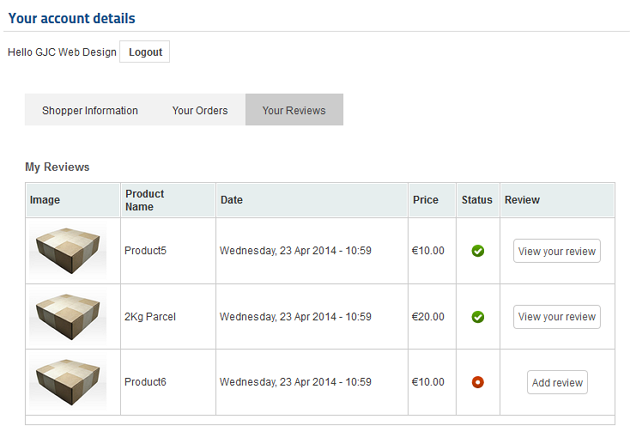 More info on the reviews component display and module plus linking to the product - all selectable. 5. Improved usability of the Account reviews section. I am considering buying this component. But I am missing one thing: Google's rich snippets. Is it possible to add those to your component so product pages also display the rich snippets (review stars) in the google organic results.? Hi, can't be difficult - what is the syntax that Google requires do you know? And would that be the average rating? What I meant in the other post is that it would be great that you sold the module too as a standalone module for core reviews also, cause there is no other around. Ouch, you are fast, was editing, oks ill do. I see one of those are using the same template as us, so that convinced me to buy it. Just one question, can I migrate current reviews?